Old maps allow us to travel through history in a better way that any time capsule would do. It's also a passport to understand a bit more about social, economic and cultural changes of a country, a city or a town. If the site in question has an important role as the birthplace of the Industrial Revolution, the research material becomes more and more fascinating. When I got this book as a Christmas present, I knew it would be a fascinating guide to discover more about West Midlands's history itself. 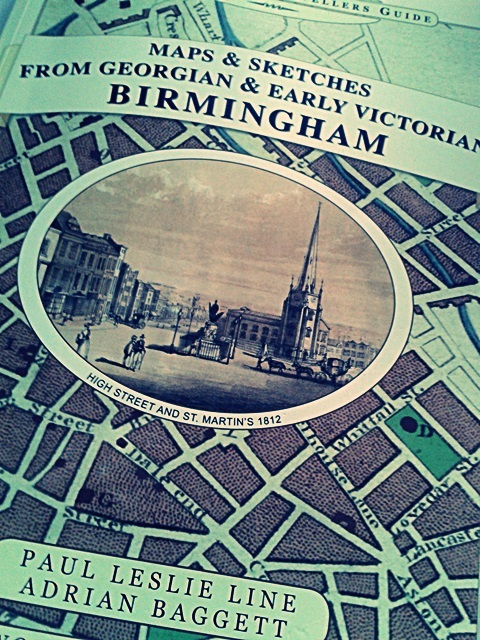 Maps and Sketches from Georgian and Early Victorian Birmingham is a nostalgic documentation of a development period in town, in a key period of preservation and/or demolition of the architecture features in the region as well. As a city in constant changing, Birmingham had faced since the disappearance of buildings the development of its canals, the born of manufacturing industry to many other factors and events that helped to build the city. The society for the Protection of Ancient Buildings, founded in 1877, and The National Trust, founded in 1884, are important resource to preserving this history. Also names such as Thomas Underwood and his visual records of the old town centre and demolished buildings kept the memory of what used to be Birmingham half a century ago, very well preserved in this book. William Dargue (Historian); Ian Henery (Walsall poet Laureate) and Adrian Baggett ( Illustrator) were inspired by Underwood's work, and this way Maps and Sketches from Georgian and Early Victorian Birmingham was produced by Paul Leslie Line, in 2013. And it's just fascinating to discover the Birmingham of old times, its prospect views and urban plans, as well as is very interesting to compare streets and building over the years. Constructions such The Old Crown, in Deritend, that is still preserved and intact. Most of the illustrations published in the book are original ones, which add an incredible perspective to the publication. Some of them are portraits that relate social aspects such as the Lunar Society, so famous for gather extraordinary Brummie entrepreneurs. Others, like old advertisement posters, bring us to a age of manufacturing boom in Birmingham. The fantastic work made by Mapseeker Archive Publishing is a book for geography, art and history lovers.